The latest available case-by-case records for June 2018 reveal a total of 11,086 new federal prosecutions were brought as a result of referrals from CBP in the five federal judicial districts along the southwest border. 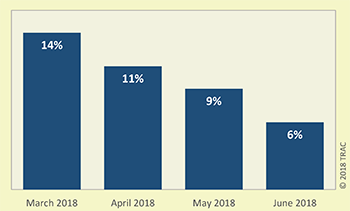 June numbers were up 20.3 percent from the 9,216 such prosecutions recorded during May, and up 74.1 percent over March figures. Despite this increase, only 46 percent of all Border Patrol arrests of adults in June were criminally prosecuted. The number of families arrested by the Border Patrol showed little indication of materially dropping. Numbers have remained quite similar during April, May and June. This meant that Border Patrol officials still had to pick and choose which adults to refer to federal prosecutors, and which adults not to criminally prosecute.